Present state: Demolished. 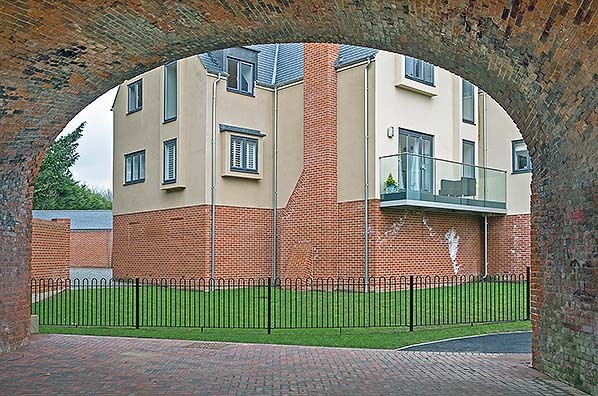 New hosing occupies the site but the adjacent road bridge survives in good condition and has presumably been retained as a feature. 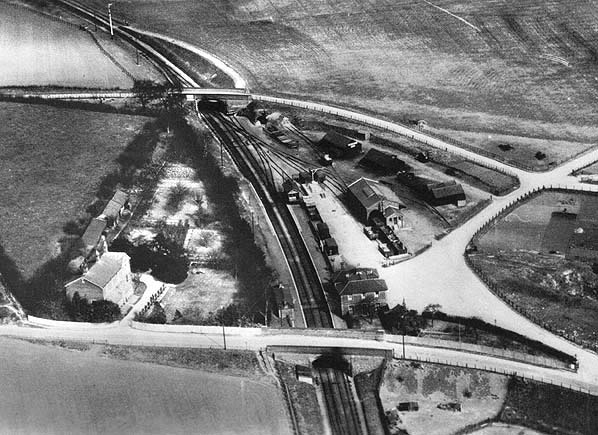 The house occupying the station site is called 'The Halt' and the access road is Old Station Close. Notes: All the buildings at Lavenham were of brick construction. 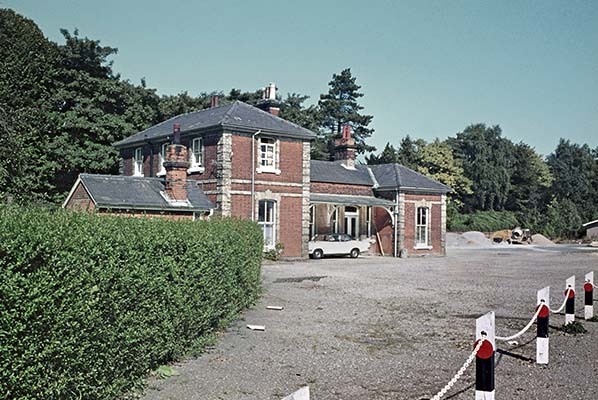 The main station building was on the up side of the line and incorporated a two storey stationmaster's house with a single storey block attached which included the booking office waiting room and toilets. The part of the building containing the booking office was slightly recessed with a small canopy between the two projecting ends of the building. There was a waiting room on the down platform. across the yard with a reversal at the back of the yard where a number of buildings were sited. There was a 1.2 ton crane in the yard. 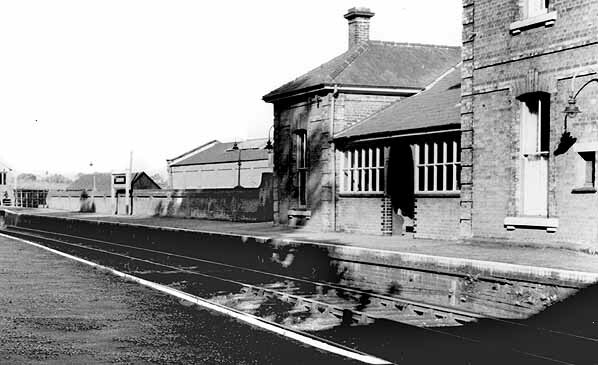 After closure to passenger traffic in 1961 the4 station remained open fro goods traffic until 19 April 1965. 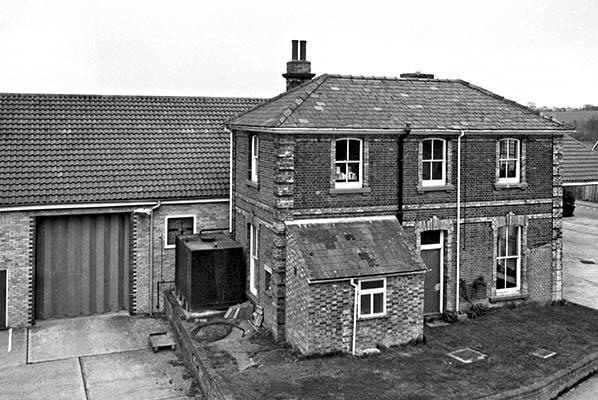 After closure a factory was built on the site of the goods yard but the station building which incorporated the stationmaster's house remained until 1978 when part of the station building was demolished. 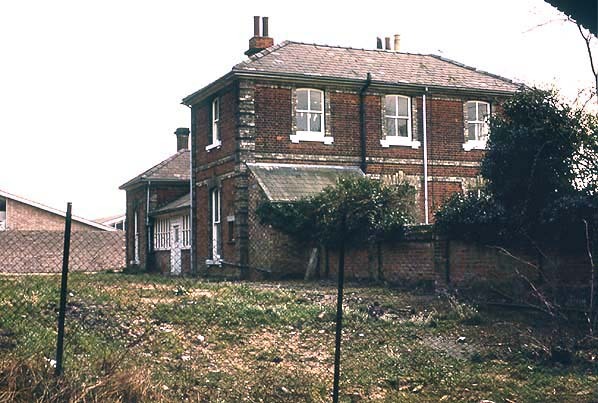 The stationmaster's house was retained at that time as part of an extension to the factory. Some time after 1985 the house was also demolished. 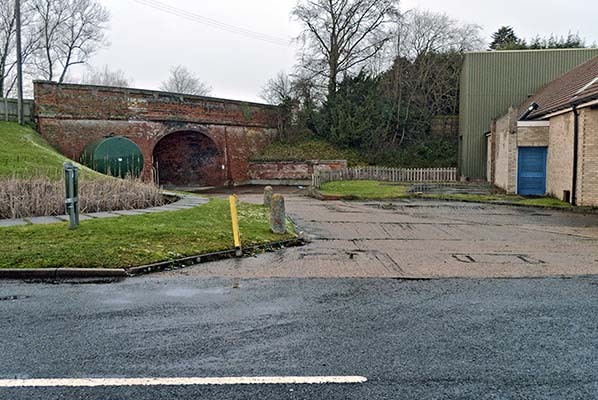 In 2012, the factory was demolished and a housing development now occupies the site..
On 1846 an Act of Parliament authorised the Colchester, Stour Valley, Sudbury & Halstead Railway to build a line between Marks Tey and Sudbury. In June 1847 further Acts were obtained allowing the railway company to extend from Sudbury to Clare with a branch from Melford (Long Melford from 1884) to Bury St. Edmunds. The company was leased to the Ipswich & Bury St. Edmunds Railway which was in turn absorbed by the Eastern Union Railway the following month. approved in the original 1846 Act. By an Act of July 1860, the Sudbury & Clare Company was empowered to build a lone from Sudbury to Clare via Melford. However, as soon as the powers were obtained, the ECR took over and immediately sought extended powers to build from Sudbury (via Melford) to Shelford on the London-Cambridge main line, as well as the branch from Melford to Bury St. Edmunds. On August 6th 1861, the ECR received approval to go ahead. However, further changes were imminent and in August 1862 an amalgamation of companies including the ECR came about and the Great Eastern Railway (GER) came into being. The Act also renewed the authorisation for the proposed ECR lines to proceed and the Melford to Bury St. Edmunds line opened on August 9th 1865 with intermediate stations at Bury Eastgate, Welnetham, Cockfield and Lavenham. The line was single throughout except for passing loops following the Upper Lark Valley to its first station. economies were made. After WW1 the economic decline of the area deepened as did the population in many towns and villages in the area together with traffic on the line. At its peak, there were 5 or 6 trains a day between Bury and Long Melford with 2 or 3 of these continuing to Marks Tey or Colchester but this was reduced in later years. Apart from local traffic, the line provided no real alternative to the Bury - Colchester service via Ipswich and elderly rolling stock finished its life on the line which didn't help with competition from road traffic. When the Second World War came, the situation changed dramatically; passenger services were reduced although freight services remained active. Changes came when British Railways announced a modernisation programme; from January 1st 1959, steam was scrapped and replaced by Diesel Multiple Units. Although passenger traffic showed some improvement, it was not enough to overcome the increasing losses being incurred. Passenger traffic between Long Melford and Bury St. Edmunds had become very light and the line closed to passengers on April 10th 1961 with freight traffic surviving between Bury and Lavenham until 19.4.1965. 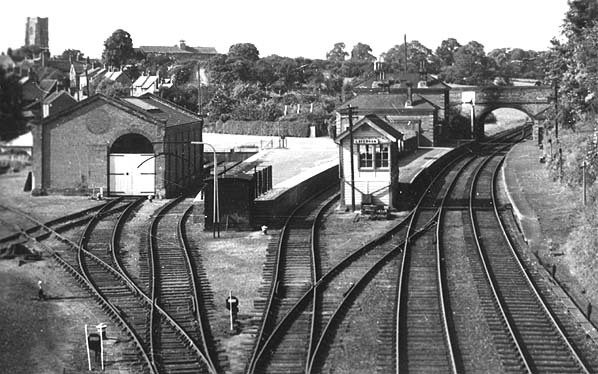 Lavenham station looking east in 1953. 1912 1:2,500 OS nap - shows an unusually large goods yard for a small country station. Reproduced with kind permission of Simmons Aerofilms Ltd. Looking south-west from Frogs Hall Road bridge in September 1959. The extensive goods yard is seen here with siding passing both side of a large dock and another passing through the goods shed. 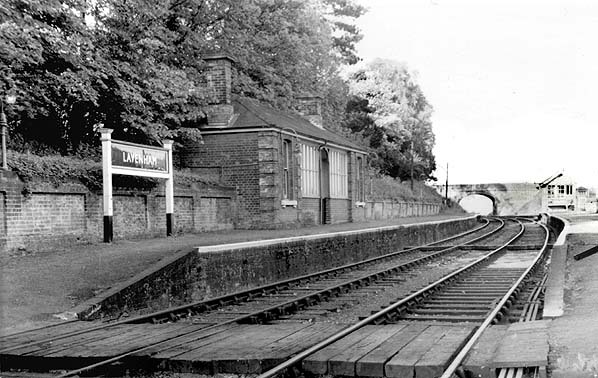 The up platform at Lavenham station c.1961. 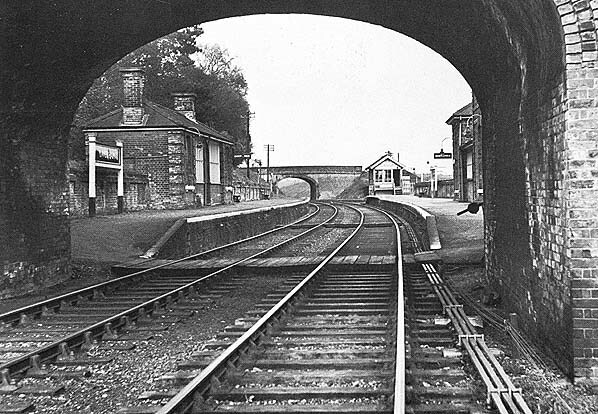 Lavenham station in 1971. 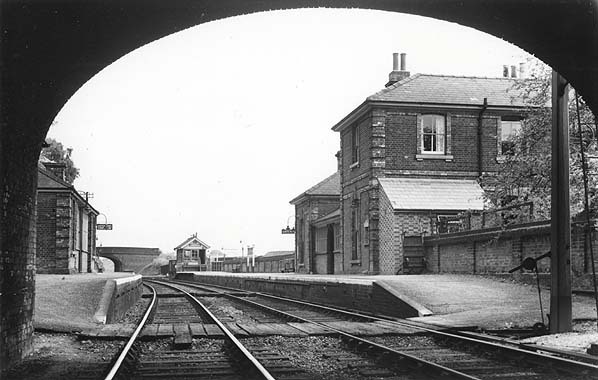 By this date both platforms had gone but the main station building was intact and in residential use. 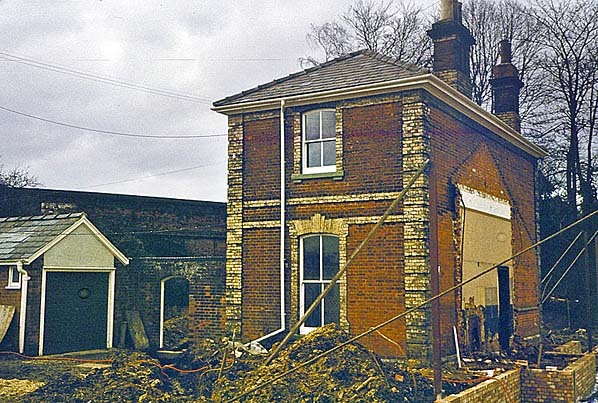 Lavenham Station in March 1976, the station building was still intact but a factory had been built in the goods yard. Lavenham station looking north-east in 1985. The site of Lavenham station looking south-west in in January 2010. By this date nothing remained of the station. The site of Lavenham station looking south-west from Frogs Hall Road bridge in in June 2012. The site has now been cleared. 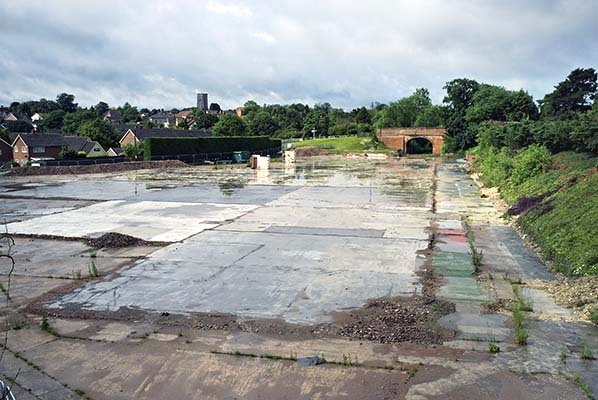 It is assumed the site will be developed for housing. Looking north-east at the site of Lavenham station in March 2016; taken from the same viewpoint as several of the pictures above.